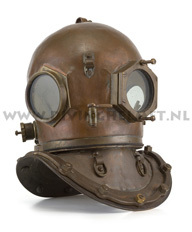 In 2007 German diving helmet collector ‘Hans Peter Will’ visited a bar in Dordrecht. 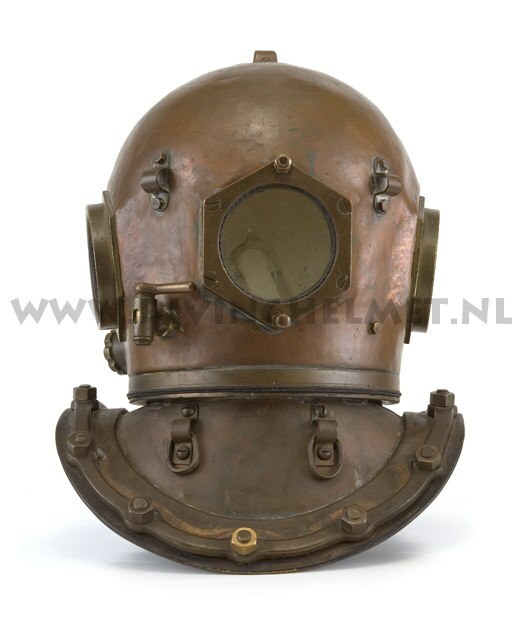 In this bar was a single diving helmet ‘bonnet’ on display. Hans Peter convinced the owner of the bar to sell him the helmet bonnet and he left the bar with a great souvenir for his collection. Shortly after, he visited the local museum in Dordrecht with the helmet to see if he could find any more information about it as the helmet has a unique style and seemed to be home made. When Hans Peter showed the helmet to the museum curator he explained that the helmet was unfortunately missing its breastplate. The curator told him to “wait a moment”, then disappeared and returned a few minutes later with a breastplate which perfectly fitted the helmet! Now it would have suited Hans Peter to donate his bonnet to the museum but instead the museum donated the breastplate to Hans Peter! For many years the helmet has been a bit of a mystery. Because even though it appears to be well enough built and dive-able, it showed no traces of ever been used. When I showed the photographs I took of this helmet to my friend Jan Paul Galdermans of Maassluis he produced some early color photographs which look as if they were taken during the 1960s. 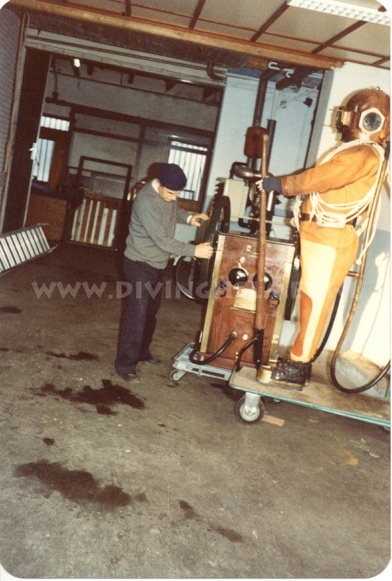 They show a man working on the display with a complete set of diving apparatus including a Siebe, Gorman pump, home-made divers’ boots and weights and what seems to be a Japanese diving suit. 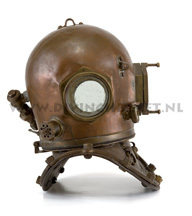 And to top it all ‘there was the strange diving helmet’ recently recovered by Hans Peter. 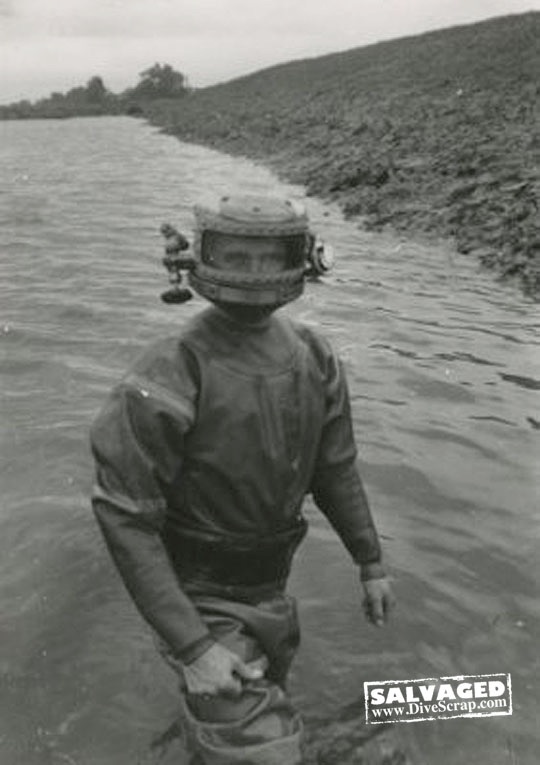 We have not been able to trace who made the helmet for many years and we wondered if the helmet was built as a display piece only and not for the purpose of diving. The 2 old color photo’s courtesy Jan Paul Galdermans. 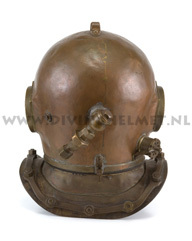 At the end of 2014 professional diver and collector of old diving gear Jan van der Slot called me with some great news. He had came across information which allows us to identify the maker of the ‘unknown helmet’(!) Jan explained me that the maker of this helmet was E.P.L. 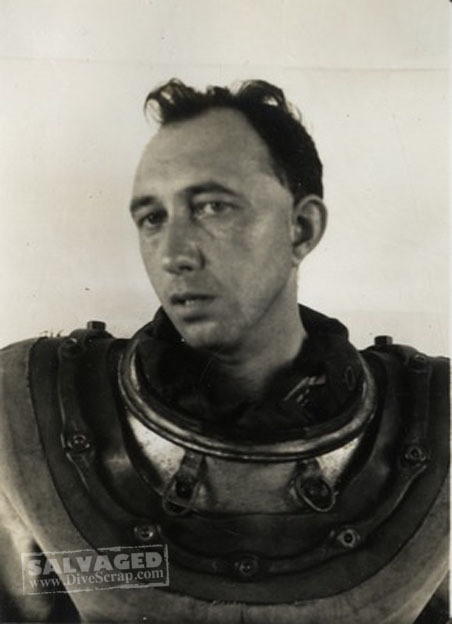 de Hoog, who lived in Alkmaar when he actually built the helmet. 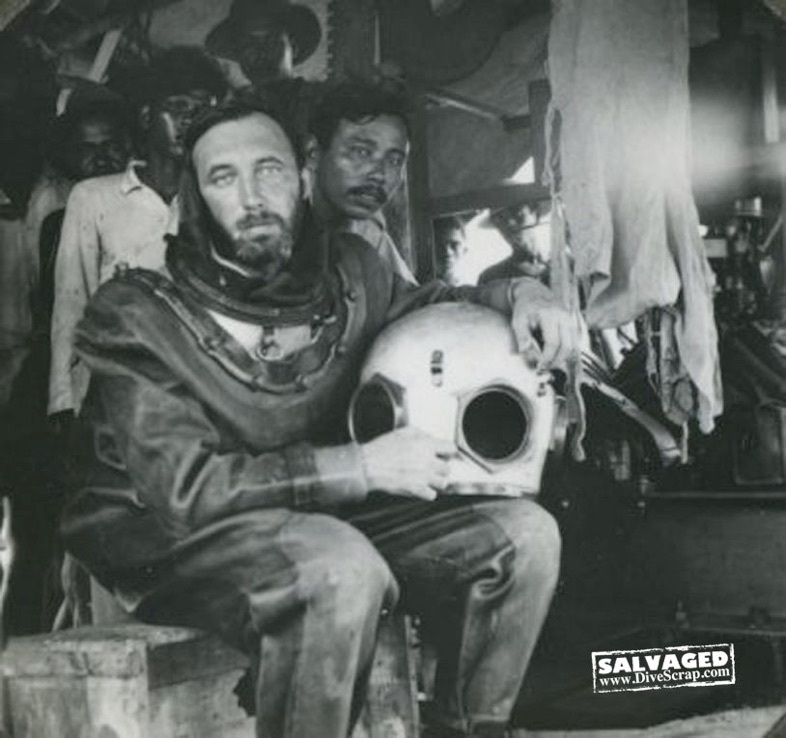 Then de Hoog took the helmet with him to Surabaya, Java (at the time a Dutch colony) where the helmet was actually used for diving operations around 1946. 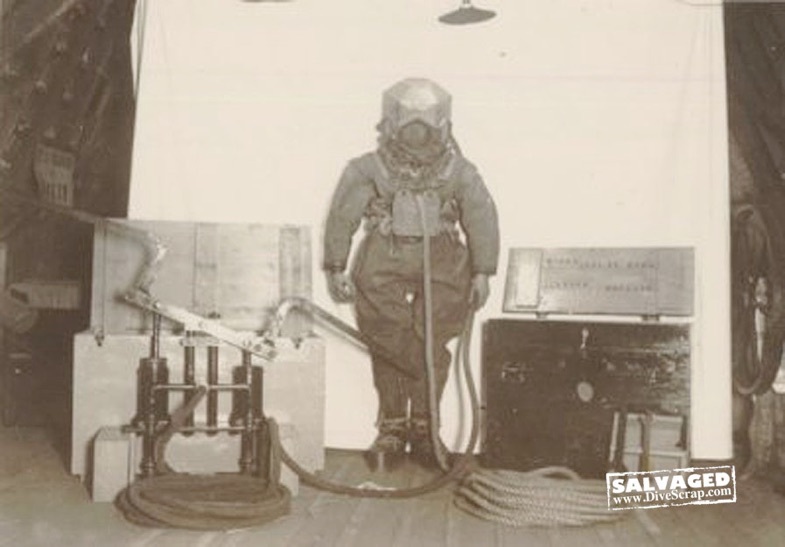 The exact purpose of the diving operation is not known. 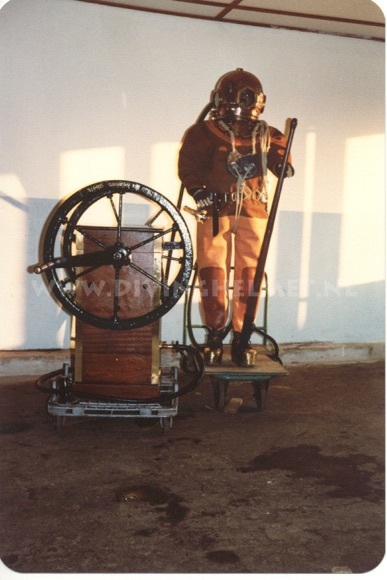 Later de Hoog came back to Holland where he started a small business manufacturing / dealing professional diving equipment in Rotterdam.